I have a brown belt, whose father has, after I gave him one month free as gratitude for his assistance now asked that I actually pay him per week for his assistance. I have never heard of this and was quite shocked (as his dad was also an old regime karateka). How would you treat this and do you actually pay assistant instructors? I have some opinions myself, which I will share, but I’d love to hear from others, so please comment! I come from a traditional point of view in which students are required to do assistant instructing as a part of their training. It’s quite valuable for the student, and it can be quite helpful for me… but it can equally be of concern. These assistants, lacking the judgment and experience of a seasoned instructor, are frankly, at times, as likely to lose a student as to help them. To ensure one doesn’t lose students due to bad handling by inexperienced assistants, one must provide training, instruction and supervision to those assistants. Sometimes you must do this on the fly during class, when you see things going awry. One could easily make the case they should pay extra for the privilege, rather than being paid. In any case, I always hope my students will appreciate the gift of training and be humble about their own abilities and position. On the other had we do want to appreciate our helpers. A colleague of mine lets his helpers earn scholarship points toward training camps and seminars. I’m sure others have creative ways of showing appreciation (please post!). You must have appreciated your assistant’s help, in wanting to give him a free month. Now the father has put you in an awkward position. I suggest you go back in time (ha ha), and create an assistant instructor program in which you state clearly what is desired and expected from assistants, set learning goals for them, and make it clear that while they are helping, they are also students. Then perhaps set up a system of rewards that you feel are appropriate, which show appreciation, but which don’t promote the idea that every helper should be paid. Set this forward for all now-and-future helpers. And decline to pay this fellow, while stressing how much you do appreciate the help they provided. Offer to let them continue on your newly-defined program, and be prepared for the dad to be unhappy. That would be my advice – but what say the rest of you out there? For discussion purposes, we agreed to limit the topic to “testing standards for children,” and not stray into “teaching methods for kids.” As important as it is to share, discuss and revisit all the tips and tricks we can use to improve performance and cure specific bad habits (like loose fists), we know that children will remain imperfect in predictably unpredictable ways, and the question will arise, again and again, what to do when an imperfect child comes up for testing. Do we advance them, or bring them to a stop? How do we decide what to do? Present for some or all of the discussion: Senseis Doug Storm and Shawn McElroy of Sung Ming Shu Dojo in Atlanta; Sensei Parnee Frederick of Revolution Dojo in Appleton, WI; Sensei Estela Atalay of Nei Ching Dojo, Miami; Sensei Ron Thomas of Tallest Tree dojo in Gainesville, FL; Sensei Lynne Correia of Blue Heron Dojo in San Diego; Sensei Tanner Critz of Unity Martial Arts, Little Rock; Sensei Kevin Cardoni of Northern Lights Dojo, Marquette, MI; Sensei Darius Jones of Crescent Moon Dojo in Pendleton, SC; Sensei Heidi Goldstein-Sidley of Concorde Martial Arts, White Plains, NY; Master Ricki Kay of Fairwood Martial Arts, Renton, WA; and Master Didi Goodman of Redwood Dojo in Oakland, CA. –	For developmental reasons, and reasons of individual difference (and sometimes disability), children cannot be expected to achieve perfection, nor consistently meet absolute standards for rank testing within Cuong Nhu. –	Instructors working with children and teens are in a constant process of evaluating, adjusting, and making individual decisions about what a student can or can’t master at the moment; things are not black and white, and this kind of flexibility is what good teaching is about. –	Even within a structured system like our children’s curriculum, this kind of flexibility also applies to testing: Instructors must decide which imperfections get a “temporary pass” and which ones constitute an absolute roadbloack to advancement. –	Instructors differ on which requirements they consider “roadblock” requirements. These may also differ case by case. 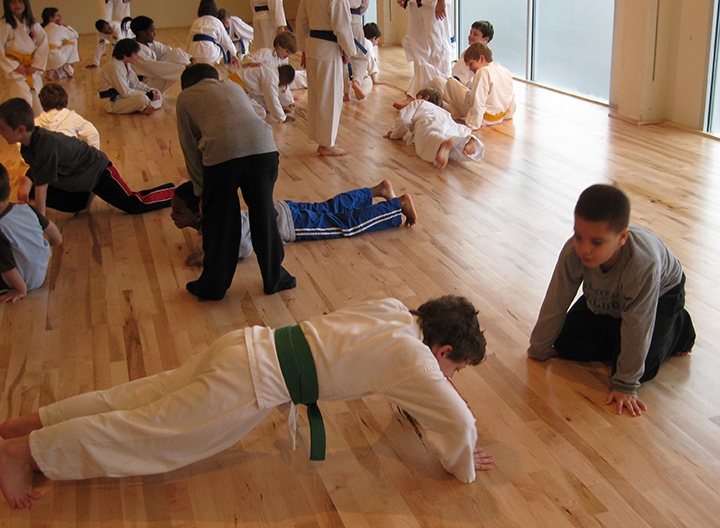 For example, Sensei Tanner regards the basic push-up requiremment as an absolute after purple belt level, whereas many of us are flexible with weak push-ups in children, but are strict in other areas. –	Children’s testing, in general, requires much greater flexibility than adult testing. –	Instructors who do not work extensively with children and youth could benefit from some education and communication from those of us who do, in order to help them understand and handle testing situations more effectively/productively when kids and youth are involved. –	As instructors, we can help a student who has weak areas, but we can’t help a student who quits. The concept of “growing into a rank” was raised and of interest to many present. Master Ricki Kay stated that, in the children’s ranks through green belt, she considers a student ready for the next belt or stripe when they have reached an excellent level of performance on their current rank requirements, along with a basic knowledge of the next level requirements. For example, a two purple stripe is ready for purple belt when their two purple stripe techniques are excellent, and they have a basic knowledge of the purple belt techniques. Upon receiving purple belt, they have the opportunity to grow into the rank by raising their performance on the purple belt techniques. This differs from the approach that would hold the student back from purple belt until the purple belt techniques were mastered to a level of excellence. In fact, it was noted, the purple belt techniques (including back stance and diagonal stance movements) are very difficult for young children to master, and the transition from 2 purple stripes to purple belt can take a very long time for those kids, leading in some cases to boredom and quitting. The “growing into rank” concept gives a different way to think about the problem. Master Ricki also used the phrase “carrying our students.” When we advance students who have weak areas, with the expectation of helping them improve or grow into their rank, we are agreeing to “carry them” to some degree. Everyone who works with young kids agrees to carry them to a certain point. We have to be conscious of how far we are willing to carry them, and how we’re going to get them, in the end, to stand on their own. Some instructors expressed concern about whether they were keeping children in rank for too long, or not testing kids often enough. The subject of realistic time-in-rank requirements needs further discussion. Several of these same issues were covered in an older blog post, “How good is good enough?”, which is worth revisiting. 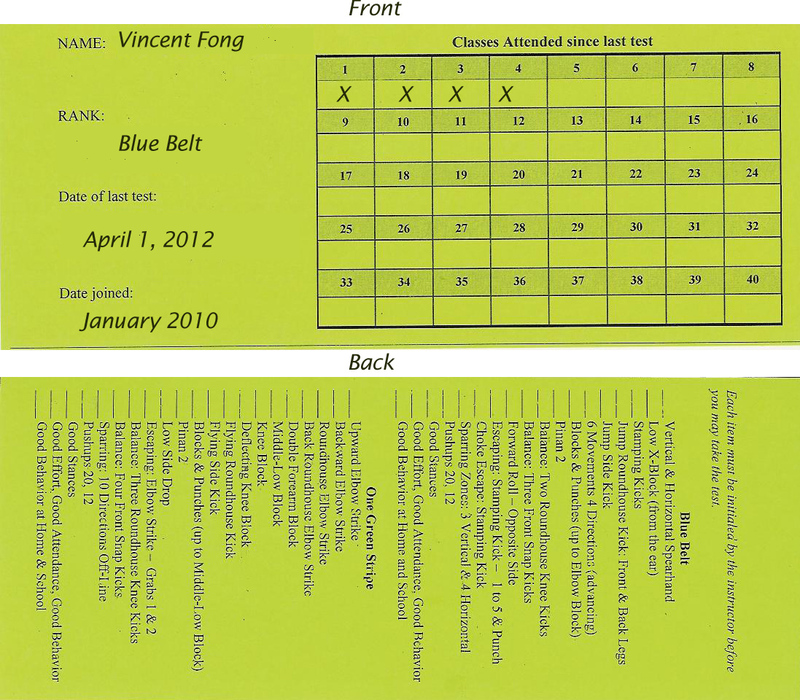 Also of interest is an older post on belt testing. We invite instructors who were present to correct or add to these notes, and invite everyone to continue the discussion in the comments section, or propose other questions for discussion. A colleague has asked us to revisit the topic of misbehaving and “low-effort” students. The students they describe are ones we all have in our classes from time to time: Those whose effort is minimal (loose fists, weak stances, lazy posture) even though they are capable of good technique; who talk and goof off with whoever is around them, as often as they can get away with it; and who don’t improve their behavior in response to any of the standard approaches (ranging from “catch them doing something good” to “sit out the fun stuff” to whatever your most serious discipline happens to be). Let’s add that, in spite of their exasperating behavior, these are not kids who “hate karate” and really just want to quit, nor are they malicious trouble-makers – they disrupt by socializing too much, not by being anti-social. So, my colleague asks, are some kids just too immature to understand the required behavior – and we have to put up with it till they begin to grow up? What approaches have other instructors tried for handling and motivating these kids? The most important members of your children’s program might just be the parents. After all, it’s parents who sign kids up, pay the tuition, drive them to class, support their practice, and decide if & when they may quit! Supportive parents give a tremendous boost to a school, both in practical terms (helping out at the dojo) and by creating a positive dojo culture. In rare cases, “nightmare” parents can have the opposite effect: Think “stage parent” interrupting class with their own instructions; argumentative parent questioning the instructor in front of the kids, or disputing a decision about tests and rank; or just, thoughtless parent talking loudly on a cell phone while letting your student’s younger siblings run amok. A colleague recently asked about dealing with parents: How do instructors handle all the issues we just listed? I’ll toss out a few specific questions, but feel free to post on any aspect of working and communicating with those vital members of your dojo community. 1. Parents don’t necessarily have a clear idea of martial arts values and etiquette when they first register their child. How do you communicate your values and expectations to new parents? through written material? website? conferences? 3. 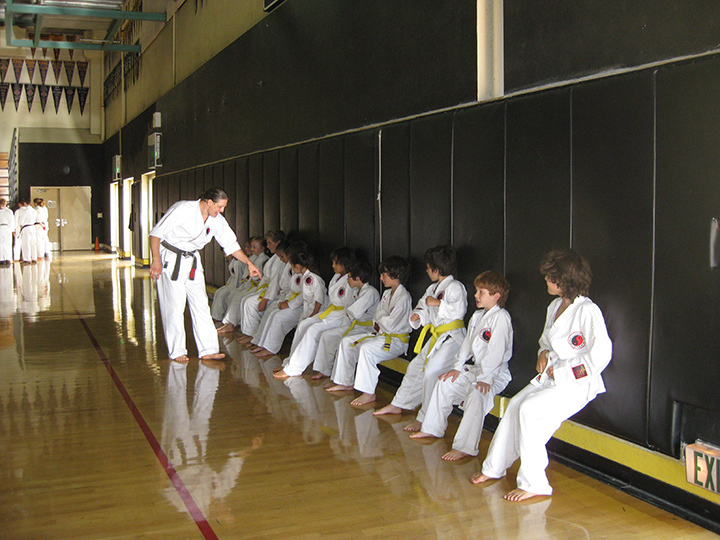 Do you enlist parental involvement in classes or dojo events? How does that work? 4. Do you talk with parents about dealing with those times when a child doesn’t want to come to class? What do you tell them? 5. Do you have a “model parent” – or have you dealt with a “nightmare parent?” Tell us about him or her. These are such important questions for a successful dojo; I look forward to hearing some great advice. 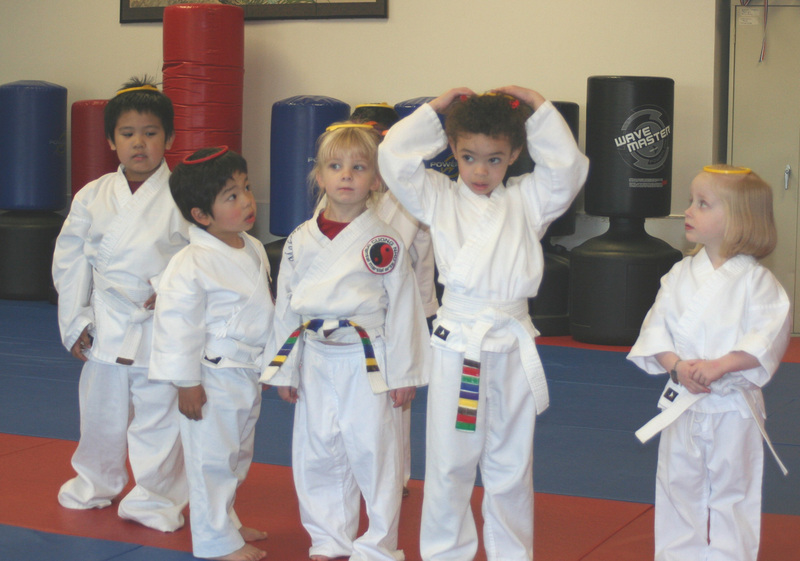 Earning rank, in the form of belts and/or stripes, is an important part of the martial arts experience for many children who train. 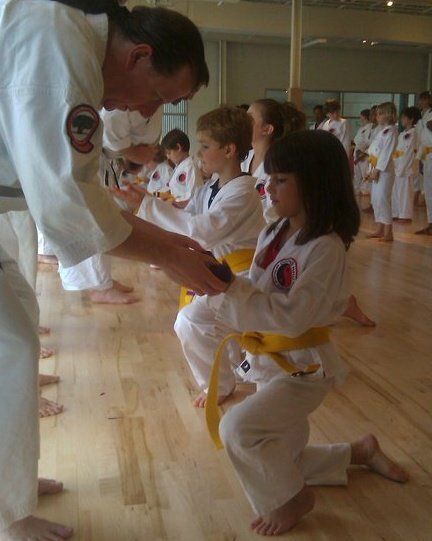 Instructors who test children for rank handle it in many different ways. Some offer tests on a set schedule, for any students deemed “ready;” others schedule a test only when there are students clearly ready. Some have special test-only days; others integrate testing into regular class time. Some tests are by invitation only; others permit students to make the choice. Some schools fail students on a regular basis, while others preclude failure by pre-selecting well-qualified candidates. Some schools I have heard of test and promote the whole student body every couple of months. Still others eschew testing and simply promote students when it seems right. How is testing handled at your school? Why do you (or your instructors) do it that way? Tell us the pros and cons. Let us know, too, how big your classes are and how many students typically test or are promoted at a time. That’s a quote from my 1991 article, “Learning from Children: Five Easy Lessons for Teachers,” in the book Martial Arts Teachers on Teaching . And, as anyone who works with kids knows, they do it frequently, often calling other kids on mistakes they don’t realize they are also making themselves. I went on to say, no offense to eight-year-olds, but that can’t be what good teaching is all about. I stressed that it takes more skill to discern what students are doing right, than what they are doing wrong. Mistakes are obvious; pointing out mistakes is shallow teaching. A similar subject recently came up in my parallel life as a writer-slash-poet. I was discussing with some writer friends an approach used by a successful local workshop leader we know. When writers in his groups comment on each other’s work, he requires them to begin with those things they liked, before launching into weaknesses and negatives. Many assume our friendly workshop leader uses this approach in order to be nice – to make people feel good, so they’ll be more likely to keep coming to the workshops. I disagree, and I link it back to what I said about those eight-year-olds, twenty-some years ago. Requiring a reader to say something positive is a way of ensuring the critic has taken more than a superficial look at the work, before going for the negative critique. Criticism (the negative kind) is all too easy – and all too satisfying for some people, given the human trait of feeling superior when putting something down. By requiring the positives, our workshop-leader friend is raising the quality of instruction, by requiring would-be instructors to examine the work more carefully before speaking. And, yes, it is more pleasant for the writer to hear some good things before the bad. This may make them more receptive to criticism, but more importantly, the criticism that comes through this process will often be deeper, more honest, and more useful. Now let’s get back to the topic of teaching martial arts. There are those who confuse positive instruction with being nice – catering to students feelings, lavishing praise while avoiding critique, never saying anything that might (supposedly) harm their self-esteem. This is a mistake. Positive instruction is not about being nice. It’s very pragmatic. It works, for one thing: Thanks to years of research in coaching and human behavior, it’s well understood now that the mind more easily processes, and the body more easily acts upon, instructions framed in positive (“do this”) rather than negative (“don’t do that”) terms. And it helps you be a better instructor. What, after all, is your job as instructor? It’s not to correct mistakes day after day (though admittedly, you will spend some time doing that). It’s to guide students on a path from where they are now, to where they could be at their best. The ability to see what they are doing right is essential to both those things: seeing where they are now, and understanding where they could be. You’ll use that knowledge to build upon and to mold. It’s essential, then, that you take the time to see it – and express it. Being nice is something altogether different. It’s about demeanor, personality, maybe personal style. Martial arts instructors come in all varieties, and I must say some of the most successful, effective instructors I know – experts in positive instruction – are the most hard-nosed, demanding, no-nonsense personalities on the mat. And they are beloved, not because they are warm-fuzzy-nice, but because there’s no question they care deeply about their students’ progress. On the flip side, although I won’t make a blanket statement, some of the warm-fuzzy-nice guy instructors I’ve seen have also been some of the least effective. The students are smiling and having fun; they leave the mat happy, and eager to come back; but on the other hand, they don’t learn much of what I’d call martial arts. Where do you fall on the scale, fellow instructors? Warm-fuzzy? Tough meanie? – And how do you integrate positive instruction into your style?